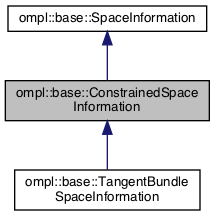 Space information for a constrained state space. Implements more direct for getting motion states. Definition at line 109 of file ConstrainedSpaceInformation.h. Get count states that make up a motion between s1 and s2. Returns the number of states that were added to states. Uses the constrained state space's manifold traversal method to obtain states. Will always allocate states. Definition at line 133 of file ConstrainedSpaceInformation.h.